We found Olive after we moved from a house in a very quiet mountain community to a bustling high-rise condo in Port Moody. 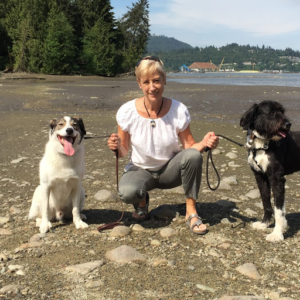 Our dogs, Google and Brie, were never perfect – we love them in all their quirkiness – but one of our neighbours gently mentioned that they were barking ‘all the time’ when we left them and we knew that wasn’t fair to anyone, including our dogs. Olive came in to assess our situation and patiently taught us about pack leadership and how we could help our dogs feel more relaxed and confident in our new home. We were completely astounded at how quickly we started to see behavioural changes, and at how quickly and positively they reacted. We can now leave them alone, and they’re also much calmer greeting people at the door. When we first heard the term “pack leadership” we were worried this might involve some sort of emotional or even physical assertion that we don’t condone, but it’s actually a very loving and respectful way to deepen our relationship with our dogs. We’re now working on recall and interacting with other dogs outside and off-leash in more urban settings than Google and Brie are used to, and we’re seeing great progress there, too. Brie recently had surgery so we’re also using Olive’s daycare and boarding services, too, and we know she’s getting loving and professional care. Most days, Brie doesn’t want to come home which pretty much says it all. We highly recommend Olive and would be happy to share our story in more detail with anyone who’s considering her program or services.